My 200NS has run for 44,000kms and coming to 4 years. And that includes the arduous 2-month SE Asia Tour earlier this year. I don’t think the fork oil on my bike has ever been changed. The Bajaj owner’s manual calls for a fork oil change interval of 10,000km. But this is one of those things that is commonly neglected – and yes, I’m amongst the guilty ones. You see, I bought the bike pre-owned and I have absolutely no history of its previous maintenance. So I took the bike to Universal Motors and tried to schedule for a fork oil change. But the mechanics there dissuaded me and casually mentioned that “it’s not a necessary procedure unless it starts leaking oil”. And since there was a pretty long queue with 5 other bikes before my turn, I decided to hold out the fork oil replacement for awhile at least. The 200NS forks getting removed. Just then, it almost seem as if my Pulsar had a soul, it didn’t seem to like the neglect treatment. And in protest, the fork seal start leaking 6 days after my visit to UM. So, now I REALLY have to get it changed. So I called up Universal Motors earlier today to check if there is a bike queue. Yeah – bummer. The wait is gonna be long. As I’m preparing for a trip to KL in about 2 weeks time, I would really like to get this leak sorted out as soon as possible. 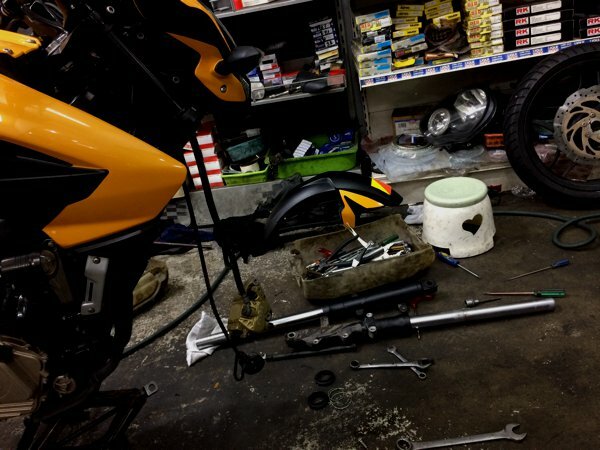 Since UM was busy, I headed to GP Motoring – a relatively reputable motorcycle repair shop that’s somewhat within walking distance from my place. 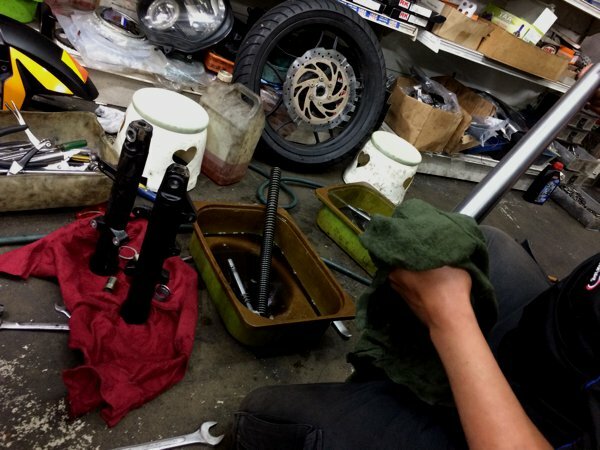 As I enquired with them, Ah Qiang, the mechanic there, informed me that while he was confident of replacing the fork oil, the oil seals will have to be ordered and will take some time to arrive. Well, since I had some time today, I decided to make a trip to UM to get the oil seals myself ($8.50 each). And while I was there, I bought a set of fork dust covers too ($6.50 each). Both forks removed. Fork removal on the 200NS is a pretty straightforward procedure. 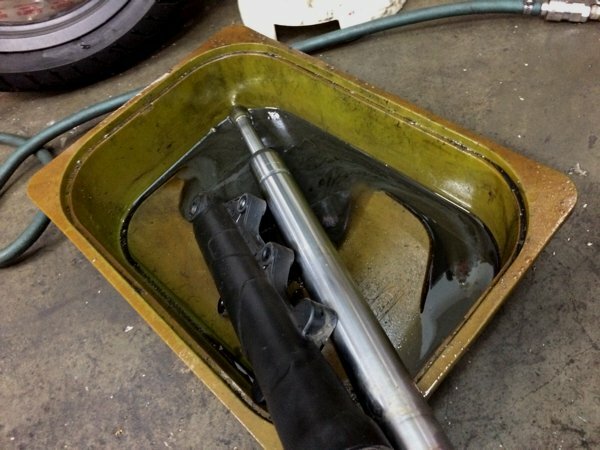 The 4yr-old 44,000km fork oil is BLACK! Yucks! The removed parts getting washed in petrol. Cleaning the insides of the stanchion. 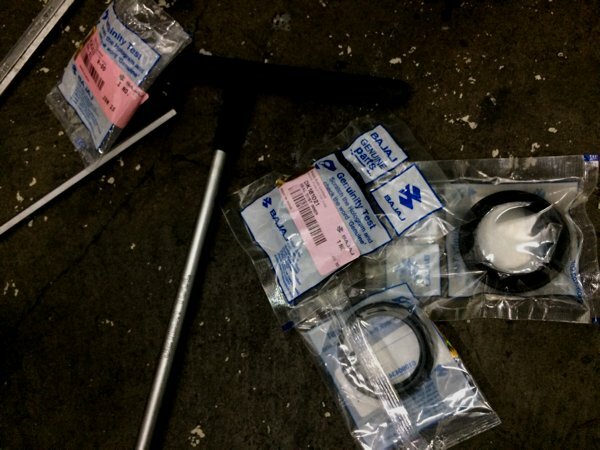 Woo… progressive springs! New seals. New dust covers. 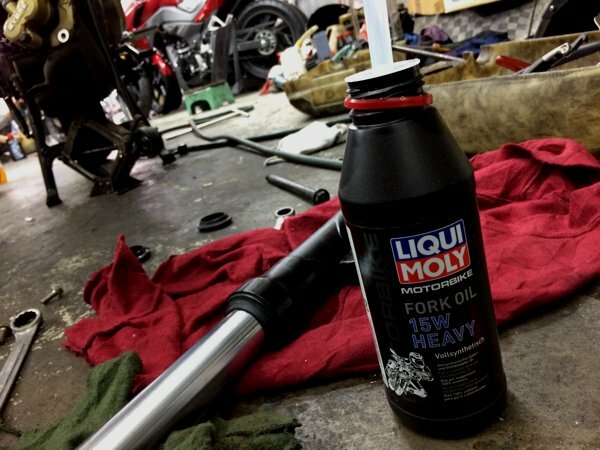 Liqui Moly fork oil. New juice for my 200NS forks. Look at that colour of the new oil! Crystal clear transparent! Wow! My black oil must have been so super broken down! Honestly, I’m not sure if it was the new oil, the 15W weight, or the 220ml per fork quantity of oil, but the ride now DOES seem more planted and I experience less nose diving when using the front brakes. The ride feels firmer, but the damping is a tad bit lesser than before the oil change. I don’t know – I don’t really have sufficient experience to comment on this. But I’m sure glad to have finally made this LONG overdue maintenance procedure! What a nice workshop, full of things………..
Nice post however it lacks more details. Did you use special tools to disassemble & reassemble the fork? I’m thinking of just replacing the oil in my forks, 8 yrs old, but no leaks so no seals required at this stage. Was it difficult to get the fork assembled, did you use a vice? I didn’t do this myself. I paid a mechanic to do the work. No special tools required. It was rather simple actually and I witnessed the entire process. 20w oil would make the damping even more suitable for 200ns.i am using motul 20w fork oil in my 200ns. Feels ways different than the stock oil and the ride quality is awesome. Viscosity of oil does make a difference in ride quality. Yep! Different weight will lead to different damping properties. 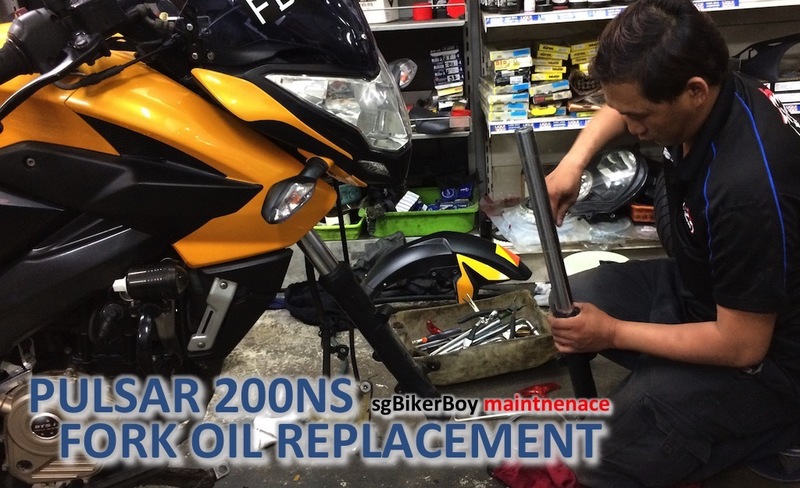 Did you use 220ml in each fork with the Motul 20W fork oil? Can any one send me pictures of front fork spring and spacer tube of NS. Why would you need these pictures? Hi my bike also don’t have spacers tubes however it’s available in part catalogue. what is the right amount of fork oil in one fork to put? According to the service manual, the Pulsar 200NS takes 285ml of fork oil when completely dry. please can you write the amont of oil for each fork.Best regards. Sure – I already did. Previous Previous post: IU Power Re-wiring – Legal or Illegal in Singapore?